sigh. according to the brochure the agent had created, the “master” bedroom wasn’t quite wide enough for our newly purchased queen bed, which was, at that point, still a (charming) boxspring and mattress set on the floor of our apartment bedroom (which was a spacious 12′ x 10′, i might add). he said the only way we could buy this house was if i was prepared for a major renovation down the road, namely adding a second storey with functioning bedrooms. i was petrified of signing us up for that headache, and expense, so we passed on the house. i locked myself in our 12′ x 10′ bedroom and cried. we went to more open houses. two weeks later, our house was still on the market (something to do with that master bedroom, maybe?) and we returned for a second look. having spent the better part of the fall seeing what $400,000 in toronto can buy a newlywed couple (answer: not much) pierre had got me onside to think of a house as a long term investment (read “it needs work”) rather than a cozy nest (read “paint and enjoy”). i was coming around to the idea of adding a second level, as long as it meant we could buy this house, which i loved to bits. in the end, this little house turned out to be the one for us. it was on a quiet street, detached, with private parking, and in a good school district (pierre’s criteria). it was super close to the subway, cute coffee shops, and a farmers’ market, plus it had beautiful hardwood floors, a great front porch and big backyard (my criteria). but we still had the problem of the master bedroom. that is, we would have to sleep in it until we could afford to renovate, and we had no idea when that might be. luckily, our bed actually did fit into the room, but just barely. and there’s certainly no room for dressers, though the closet has double doors and is not a bad size for a house built in the 1940s. we got comfortable with the reality that our bedroom was going to consist of a bed and an alarm clock on the floor for a few years. we keep off-season clothes in bins in the basement. i came across a post on daniel kanter’s excellent blog, manhattan nest. he had made these amazing lights for “$20 and 20 minutes” (not my experience, in the end) that i thought would work perfectly in our bedroom, because they are super skinny and mount to the wall. i couldn’t wait to add something to the bedroom that would, just maybe, make it feel like a finished room. 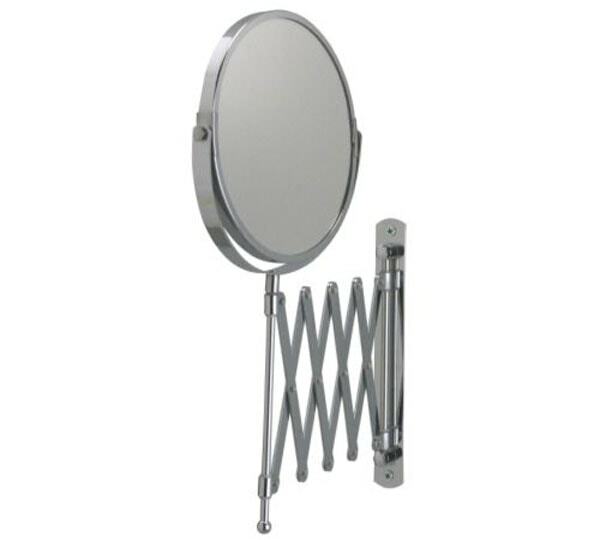 first stop was ikea, for two frack mirrors, which are those mirrors you can mount on the wall next to your sink to magnify your pores. trust me, using them as a base for two super cool lights is way more fun and rewarding. first off, these mirrors cost $12.99 in canada, triple what they cost daniel in new york, so i was already over budget. plus, since i can never go to ikea without buying more than i intend to (over budget, again), i also bought two white lack floating shelves (only 11 3/4″ wide and we had 12″ on either side of our bed!) to create nighttables for us. after all, what’s the point of finally having a light to read by, but nowhere to put a book? then, i needed special side outlet sockets. i say special because these suckers were not easy to find. most sockets have a hole for the lamp cord to exit out the bottom, but because i was going to be screwing the bottom of the socket to the frack mirror, side outlet sockets were necessary. daniel had found them easily, but i tried home depot, home hardware, living lighting, paul wolf electric, and eclectic revival with no luck. i resorted to the internet. Many, many hours later I found exactly what I was looking for from a lamp parts supplier in Connecticut, WN DeSherbinn. Unfortunately, they had a $30 order minimum and my two sockets only came to $21, so they charged me a $10 handling fee on top of shipping to Canada, which was another $15. But, they came already wired, so I didn’t have to buy cord or plugs, or wire the socket myself. i still needed the most important part, what daniel called the adapter nut. that’s what makes the frack post big enough to screw the socket to. clearly, toronto does not have the same demand for cheap lighting supplies as manhattan, because this was something else that was impossible to find. i settled for regular socket posts and then needed to figure out how to get them to adhere to the frack. i tried using a caulking gun first, and it hardened pretty nicely, but as soon as i started trying to screw the socket in place, they loosened off really quickly. i cleaned off all the caulking and pierre suggested i mix up some epoxy; nothing messes with that stuff. i poured the epoxy into the posts, filling the space between the inner walls of the posts and the frack spindle like a pool. then i painted some where the edges of both pieces met for good measure. by the next day they were hard as rocks and ready to become lights. the edison bulbs i chose to finish things off are actually part of these beautiful pendant lights we bought from eclectic revival in the junction, to hang over our kitchen island. well, as is clear from the width of our bedroom, we haven’t started our renovation yet, so we don’t have a kitchen island. these bulbs were lighting up nothing in our basement, so i stole them for this project. ta da! special thanks to daniel over at manhattan nest for the idea. Great ideas about the lamps!! Thanks for the kind words, Lauretta! I totally love Covet Garden. Hey Kendall, I enjoyed hearing about how you & your hubby made the decision to buy your house, given that you knew it would eventually need a new and more spacious lid;). It’s such a big decision so I’m not surprised that you’d need a few weeks to really be sure before taking it on. We have potential to add a third bedroom on the upper floor at back of our house, but at the moment it seems like too daunting a project. Moving out? Structural issues? A big hole where a wall used to be? Ugh. On the other hand, what a master suite/kitchen/deck that would be … Decisions, decisions. Thanks for coming back! Our drawings are still with the city, awaiting permit. It took us nearly a year to get the plans “just right,” so we submitted months later than we probably should have if our goal was to build this fall. Looks like we’re going to have to wait until the springtime, but now we have bedside lights and tables! So all is well with the world. I would totally go for the third bedroom! But, I’m terribly sentimental about places I’ve lived (and still get wistful running by our old apartment building), so I’m maybe not the best person to weigh in. Sounds like you’d be a good candidate for Love It or List It! (A show I’m shamelessly addicted to.) I think they might even put you up in a hotel while they do the reno work? I’m still sentimental about a bachelor apartment I lived in a few years ago … I re-tiled the floor (stick ons) and painted my furniture/accessories to match the walls so that it felt bigger. What I really miss was the closet. It seriously had the best closet ever.